Lightbulbs gleamed in the theater’s marquee. A chandelier hung from the sparkly ceiling like a Chinese lantern. Spotlights crisscrossed a wall of ripply curtains. 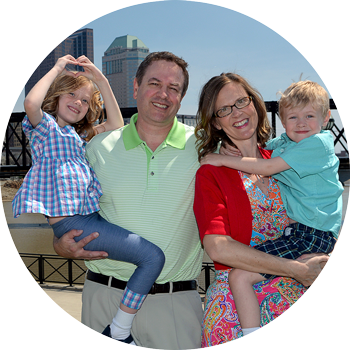 The stage was set as my family entered the opulent Ohio Theatre in downtown Columbus. 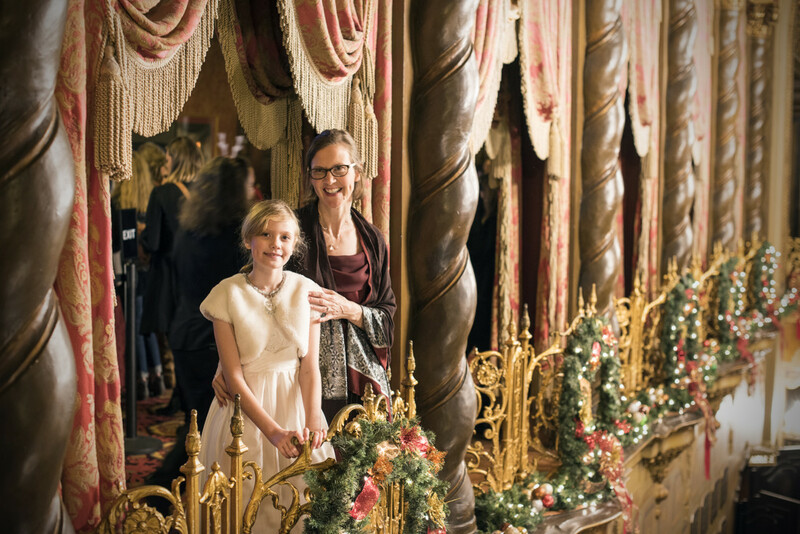 My daughter and I were decked out in our finest attire, ready to experience BalletMet’s annual performance of The Nutcracker. The event gave us just the excuse we wanted to play dress up for the evening. I wore a decades-old bridesmaid’s dress, and my daughter wore her Communion dress that now graced her knees instead of the floor. Since 1974, The Nutcracker has dazzled audiences looking for even more reason to celebrate the season in central Ohio. The 40th annual show doesn’t disappoint, running Dec. 8-24. 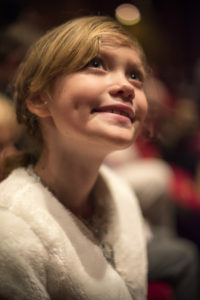 The Columbus Symphony Orchestra performs Tchaikovsky’s original score from the orchestra pit as professional dancers and students from BalletMet dance their toes off as memorable characters such as Clara, Herr Drosselmeyer, the Mouse King, the Sugar Plum Fairy and the Nutcracker Prince. Highlights of the 2-hour show include watching the robotic moves of the dancer who plays the doll, admiring the outfits of the Flowers, and trying to figure out how the children spring from Mother Ginger’s skirt. Learn more about this holiday classic. 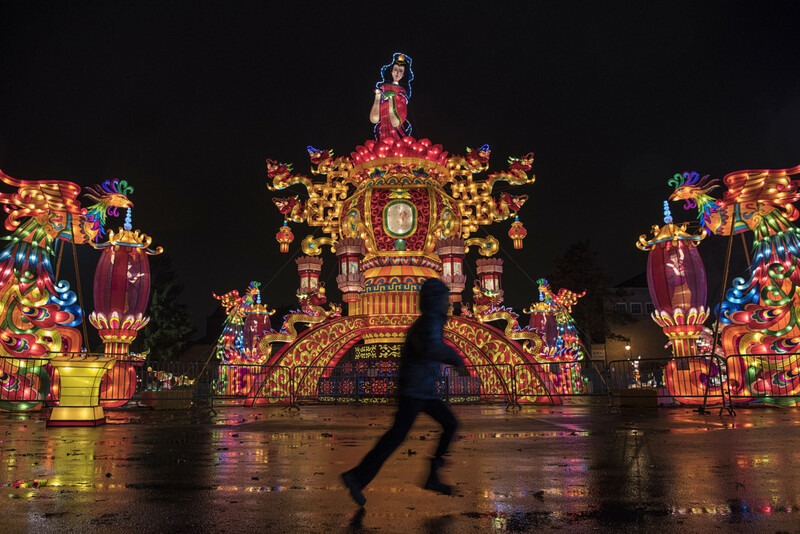 See dozens of illuminated displays at the Ohio Chinese Lantern Festival, running 5-10 p.m. nightly, Nov. 17-Jan. 7, at the Ohio Expo Center and State Fairgrounds in Columbus. Unlike drive-through light shows, the festival allows visitors free-range access of the outdoor space. Like an outdoor museum, you can inspect the craftsmanship of these elegant but sturdy lanterns up close. We thought this year’s layout was much better than last year’s – the first year of the festival. There are many new lantern designs, such as a fun tunnel of Anime-looking critters and a dazzling, multi-story pagoda. The displays are located in the Natural Resources Park of the fairgrounds, which leads past Smokey Bear. 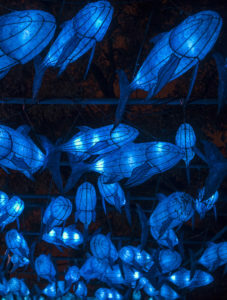 Six weeks prior to the show, dozens of Chinese artisans assembled the lanterns in Columbus by stretching silk fabric over metal frames, a tradition that dates back thousands of years. They’re illuminated from within by bulbs and accentuated by thousands of LED lights. The traveling show is produced by Tianyu Arts & Culture, based in Sichuan province of China. There also are nightly performances by Chinese acrobats and martial artists, as well as food and crafts. Tickets are $15 for adults, and $12 for children. Discounts are available. Learn more and purchase tickets at www.ohiolanternfestival.com. Central Ohioans need not travel far this holiday season to see a magical train exhibit built by a landscape magician who turns natural objects, such as nuts and shells, into fanciful displays. The Huntington Holiday Train chugged into the lobby of the main branch of the Columbus Metropolitan Library, 96 S. Grant Ave., on Nov. 25 and will remain there until early January. The exhibit features a half dozen model trains and trolleys meandering around a snowy mountain scene with 45 handmade buildings that resemble a German village. Trains, including Thomas the Tank, dart in and out of tunnels and cross over bridges. A pristine castle is perched atop the mountain, and a waterfall cascades down its center. The display was created by Paul Busse, founder of Applied Imagination in Alexandria, Ky. Busse, who studied architecture at Miami University and landscape architecture at Ohio State University, builds small-scale replicas of world-famous landmarks out of a palette of whimsical, natural elements. His work is heralded at annual displays in New York, Chicago and Washington, D.C. The exhibit was the inspiration of the late Frank Wobst, former chief executive of Huntington Bancshares. Wobst kept close ties with his hometown of Dresden, Germany, and even promoted a sister-city relationship between Columbus and Dresden. He raised money to help rebuild a church that was destroyed in Dresden during World War II. A small version of the church, the Frauenkirche, is represented in Busse’s display, which was a feature attraction at the Huntington National Bank for two decades before it moved to the Main Library three years ago. “We’re all train nuts,” he said. 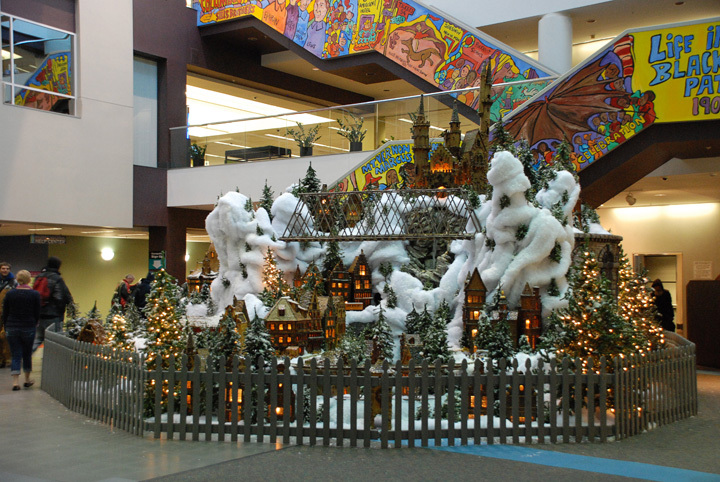 I learned that it took a crew of 20 people more than 300 hours to assemble the magnificent display. Max joined other excited children in viewing the splendor. “It’s magic,” said Mayer, who works for Busse. “Just look at the buildings. They all glow with lights. The Main Library is a great place for families to visit year round, not only for a wide selection of books, but also for interactive spaces in the children’s section. Look for a castle-shaped reading area, a large play space with a puppet theater and train table, and a story cove with sea-life mural. For more information, and to learn about upcoming events, visit www.columbuslibrary.org/locations/Main. I recently visited the library with my 3-year-old son, Max, arriving in time to see the assembly crew admiring their work. Included among the workers was Mr. Busse himself, now 63 and affected by Parkinson’s disease. He spoke to me in a whisper. Even though the holiday shoppers are long gone, downtown Columbus is more festive than it’s been in years thanks to exciting bursts of light and color at the city’s impressive new parks. My family and I experienced the city’s holiday display firsthand after attending the kickoff event, called the “Grand Illumination,” on Dec. 2. That’s when Mayor Michael B. Coleman flipped a switch to power more than 80,000 lights at the recently revamped Bicentennial Park and Scioto Mile park along the Scioto River. 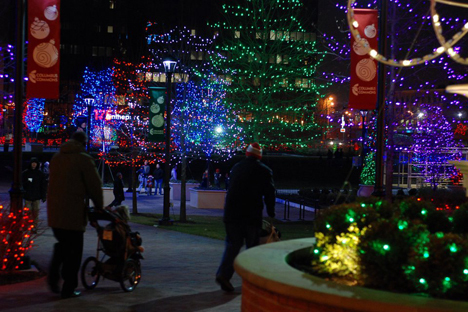 More than 100,000 lights also were lit in Columbus Commons, a 9-acre green space in the heart of downtown, where shoppers had flocked to the City Center mall for two decades. These lights, as well as other displays at City Hall and the Ohio Statehouse, will remain lit each night through early January. My family loves to drive around central Ohio looking at Christmas and other holiday light displays, but the illumination event introduced a new way of appreciating downtown’s outdoor lights – on foot. We began our adventure at Columbus Commons, where parking is available in lots accessible from 3rd and Rich streets. We then walked west on Rich Street toward Bicentennial Park, where Rosie and Max frolicked around the park’s fountain – its waterspouts replaced by colorful, animated lights. Nearby at the new Milestone 229 restaurant, customers sipped wine and noshed on gourmet eats while gazing outward. We listened to a children’s choir singing on the Bicentennial Park stage before the mayor began the holiday light display. Then, we journeyed north along the Scioto Mile walkway, called the Promenade, which runs parallel to Front Street. We saw the LeVeque Tower reflected in the river, its multi-colored lighted top resembling a rocket pop. We then walked east along Broad Street, passing the Christmas tree at City Hall, where children can drop off letters for Santa. Our path took us past the Palace Theatre and to the luminous corner of Broad and High, where we turned south along High street to view the big tree at the Ohio Statehouse and the decorated window displays at the former Lazarus building. Max liked pressing his face against the glass to see a family of mannequins staged around a Christmas tree with toys piled high beneath. We saw more decorated along Town Street, including the original 12 Days of Christmas display from the Lazarus department store. To view the lights, you might head downtown Dec. 16-18 for the Columbus Commons Holiday Fair, which will feature a Secret Santa Shop, train rides and a petting zoo. It’s worth the trip. Visit ColumbusCommons.org for more information. When I first moved to Columbus in the late ’80s, one of my top holiday joys was touring the Christmas displays in the downtown area. A favorite stop was the Nativity scene located at the State Auto Insurance Co., 518 E. Broad St. 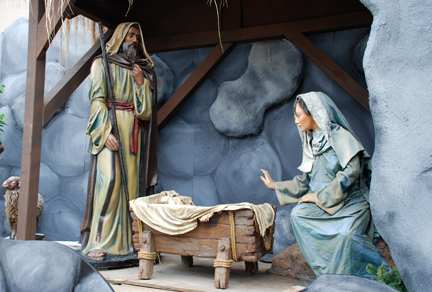 The life-size figures depicting the happenings at the time of Jesus’ birth always drew a crowd. People gazed quietly as if witnessing firsthand the holy event that took place so long ago on a quiet night in Bethlehem. At the time the figures were located on an elevated platform in front of the State Auto building. Last year they were moved to a park adjacent to the insurance company at the corners of E. Broad and N. 11th streets. It’s also when I introduced the magical display to my young children. The State Auto Nativity display is free to browse about and contains 80 figures of people and animals constructed of plaster. They’re each realistically painted, some with unique handcrafted features such as strips of leather simulating hair on a shepherd boy’s head, and frayed rope as the fur on sheep. The hay atop the manger is made of hula skirts. The figures are assembled in various scenes beginning with one depicting the angel Gabriel informing the Virgin Mary that she’ll be blessed with a son who shall be named Jesus. The labeled scenes also include the Three Wise Men arriving on noble camels bearing gifts for the newborn king. The final scene is of Mary and Joseph in the stable beside an empty manger. The figure of baby Jesus will be placed in the manger at 7 p.m. on Christmas Eve. Visitors can take a cell-phone tour or learn about the display through State Auto employees and retirees serving as tour guides. Local choirs perform throughout the season, with most occurring at 7 p.m. on weekends. A schedule is posted near the display. That’s also where you can pick up a pamphlet that details State Auto’s history of displaying dramatic Christmas scenes since the 1930s. The Nativity display is open through New Year’s Day. You can examine the figures in daylight, but they’re at their most dramatic under lighting after the sun goes down. The display is lit daily from 6-8 a.m. and from 5:30 p.m. to around midnight. The display then remains lit until 8 a.m. on Christmas Day. For more information, visit www.stateauto.com/about/page.aspx?id=2042. Get a savory taste of a traditional fair before the granddaddy Ohio State Fair takes over Columbus later this summer. The Franklin County Fair in Hilliard, a suburb west of Columbus, is one of the earliest in the state’s fair season. It’s also one of the lengthiest, stretching eight days in July at the Franklin County Fairgrounds, 4100 Columbia St. The Franklin County Fair dates to 1917, making it one of Ohio’s oldest county fairs. 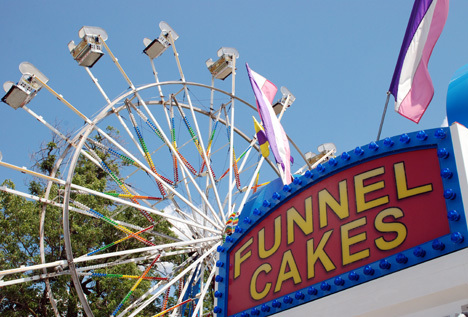 The 80-acre fairgrounds come alive each year with the usual fair fixings, including candy apples, elephant ears, fresh-squeezed lemonade and Italian sausage sandwiches. The midway bustles with skill games and exhilarating rides. More than 45,000 people attend the Franklin County Fair each year, says Melissa Brinkerhoff, who’s on the board of the Franklin County Agricultural Society, which runs the fair. “It’s inexpensive and small enough that families with small kids and with strollers can easily get through it in a day,” Brinkerhoff said. During a tour of the location a day before the fair started, I caught a glimpse of a horse named Andy, which Brinkerhoff’s son, Brad, shows through the 4-H program. Brad is one of more than 700 youngsters who will showcase animals including rabbits, goats, cows and sheep. The fair also has a tractor pull and demolition derby, as well as ongoing entertainment including Nojoes Clown Circus and Jesse & James Mutts Gone Nuts Show, which features a cohort of rescue dogs. A unique characteristic of the fairgrounds is an onsite historic village called Weaver Park that includes a log cabin, one-room schoolhouse, chapel, outhouse and covered bridge. It’s operated by the Northwest Franklin County Historical Society, which also is housed on the grounds. The society will be open from 1-7 p.m. each day of the fair, except July 24. This year the society is proud to showcase its renovated 1923 C&O red caboose and 1800’s mobile voting booth. “The villages make a great stop for families to have an impromptu picnic,” Brinkerhoff said of the grassy area surrounded by tall oak trees. General admission to the fair is $6. Learn more at www.fcfair.org. The Columbus Zoo and Aquarium is making the holiday season even brighter this year with its “green” Wildlights display, running now through early January. It’s one of the best ways for central Ohio families to spend a holiday evening if it’s not raining or too frigid outside. The two million shiny lights in this years’ display illuminate more and use less electricity than traditional bulbs because they’re LEDs (light-emitting diodes). They also last longer. But nevermind the technical stuff. The zoo’s annual holiday display wows visitors with its fun animal shapes, musical choreography and intensity. 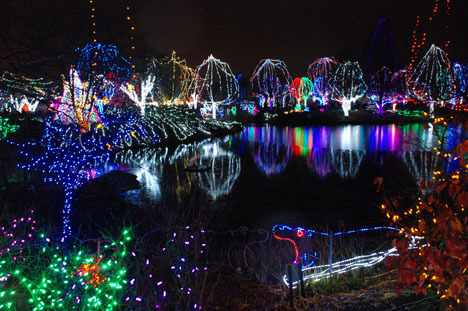 The lights are strung among the zoo’s eight geographic regions, where more than 5,000 animals are housed. It’s a pleasure to walk through this light show, not drive by it or through it. The grandest display is around the zoo’s pond. The lights reflect upon the water, creating a brilliant scene. I’m keeping my fingers crossed for a late autumn snowfall, which no doubt would yield a magical backdrop. The zoo also is planning special activities in conjunction with the lights display such as Santa’s Reindeer Corral, where guests can meet four of Santa’s reindeer friends that reside at the zoo, and Animals on Safari, an energetic animal show with performing dogs, cats and other creatures. Kids also can decorate a cookie in Mrs. Claus’ Kitchen and get their photos taken with Santa. If you’re chilly, there are plenty of indoor exhibits to duck into. We enjoyed visiting the elephants. The Columbus Zoo is a wonderful place to visit because of encounters such as these. Recently the USA Travel Guide named it the No. 1 zoo in the country. A lot of the publicity comes courtesy of Jungle Jack Hanna, the director emeritus whose many public appearances through the years have propelled the zoo into the national spotlight. The zoo is located just north of Columbus in Powell at 4850 W. Powell Rd. Wildlights hours are 5-9 p.m., Monday-Thursday; 5-10 p.m., Friday and Saturday; and 5-9 p.m., Sunday. The zoo will be closed Thanksgiving Day, Christmas Eve and Christmas Day. For more information, visit www.colszoo.org.